July 2010: Month Of Weather Extremes! 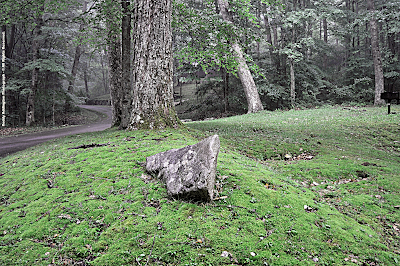 July 2010 ended damp and foggy in the High Knob highcountry with temperatures in the 60s throughout this final day of the month. 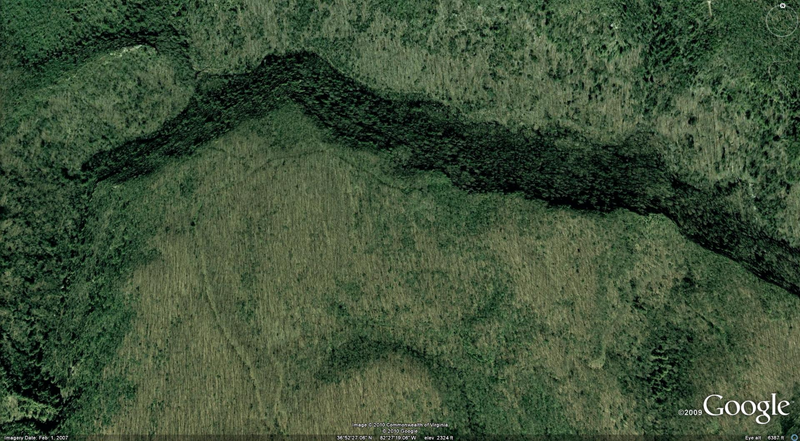 Imagery Courtesy of Goolge Earth - © All Rights Reserved. Typically huge rainfall variations common to July, and mid-summer in the convectively active southern Appalachians, were again observed across the High Knob Landform during 2010. The often wet City of Norton came in with its third driest July since precipitation record keeping began 27 years ago with only 2.43" of rain as of 9:00 AM on July 31 ( 2.88" through midnight July 31 ). South of the city, by contrast, portions of the High Knob Massif had 7.00" to 8.00"+ of July rainfall in northern Scott County, Va., within the 58.3 square mile expanse of Big Stony Creek and Little Stony Creek basins of the Clinch River. Jack Pitts, Superintendent of Appalachia Lake Water Plant resting upon ruggedly majestic Little Stone Mountain of the High Knob Massif, reported 5.41" of July rainfall only 6.7 air miles WSW of the official Norton Water Plant measuring site. 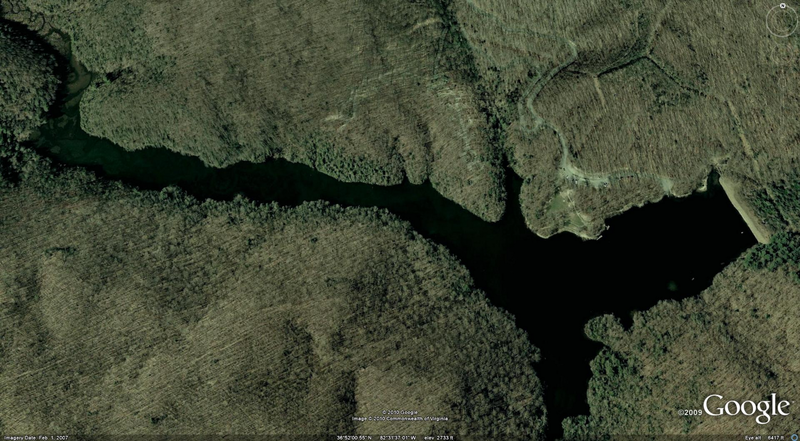 [ Appalachia Lake has a relatively small watershd that covers only a portion of the image below. The Lake had a 122-day supply of water as of August 2, and was down -8.5 feet below its spillway ]. Geneva Varner, Superintendent of North Fork of Pound Reservoir in northern Wise County, Va., reported only 3.12" of July rainfall ( well below the 4.90" average observed during the 33-year period from 1966-1998 ). In dramatic contrast, again, rainfall totals along the northwest flank of the High Knob Landform topped 8.00" within portions of Cumberland Gap National Historical Park. To the southeast, leeward of the High Knob Landform, July rainfall tallies reached only 1.58" at TRI ( the official measuring site for the Tri-Cities ) and 1.94" in Kingsport. How do such large summer rainfall variations develop? The development of positive and negative feedback processes between the atmosphere and underlying topography is a common feature of every warm season upon "this pale blue dot." Feedback processes play important roles in the large-scale propagation of wet and dry patterns during the warm season, often acting to either enhance drought or wetness across a region. On smaller scales feedback processes tend to effect the seemingly chaotic pattern of hit-miss summer convection, with the net impact being the localized development of pockets of wetness and relative dryness ( i.e., the dryness may not be of drought intensity but relative only to formation of wet to super-wet locations across the landscape ). 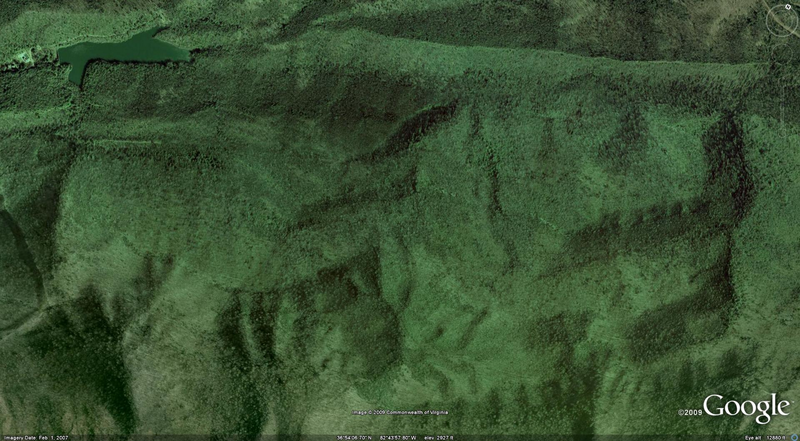 Within mountainous topography these moisture differences can be accentuated by local terrain effects. 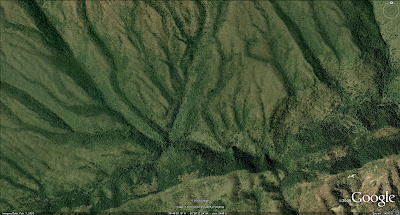 The High Knob Massif is large and diverse enough to have these processes play an important role in the pattern of its warm season precipitation each year, with portions of the great massif becoming much wetter than other locations every summer ( the location of wettest and driest places varying from one summer to the next, and during any given month dominated by convection ). [ NOTE: The following image reveals one of the incredible aspects of the High Knob Massif which makes it unique in the Appalachians from this perspective of a singular mountain. Very large base to base widths. It is most impressive along SW to NE, NW to SE, N to S and W to E diagonal lines. Imagine, for example, having to walk across the entire expanse of this image ( and beyond it in many cases ) in order to travel from one side to the other! ]. [ The southwestern and eastern ends of the High Knob Massif still can not fit into this view from 13.66 miles out in space. 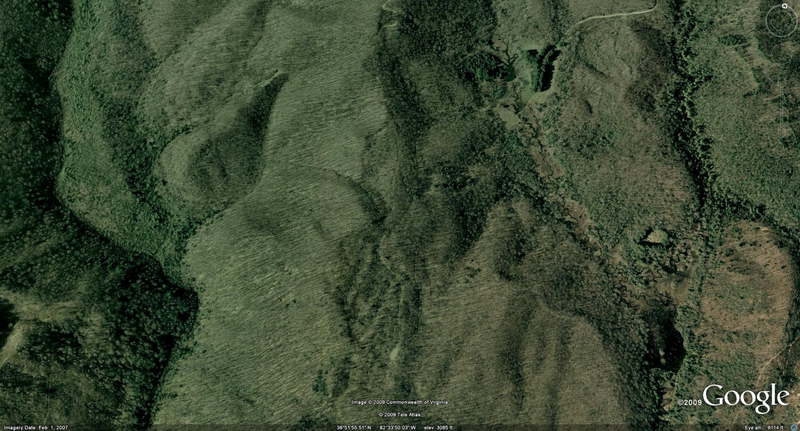 The High Knob Massif being the remnant highcountry of the High Knob Landform. 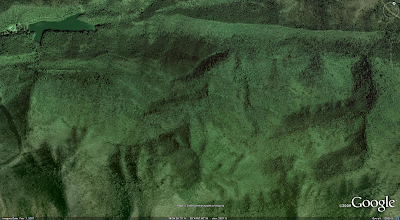 A MUCH larger mountain landform that includes its eroded calcareous core and remnant NW & SE mountain flanks which are continuous with the massif above ]. 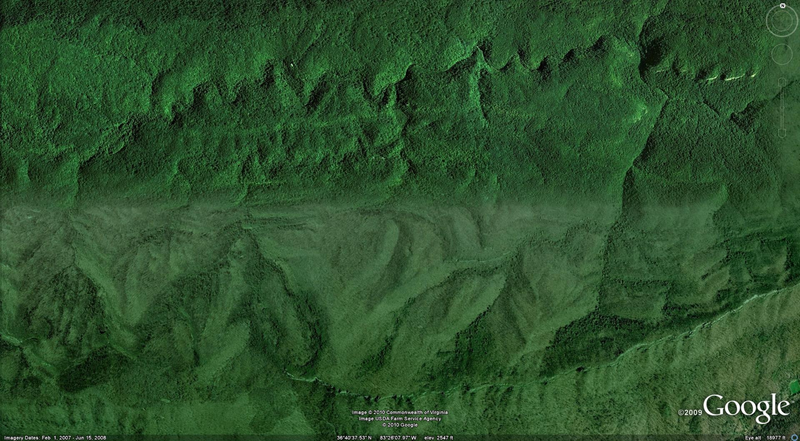 [ Using Google Earth, a zoom out to around 14 miles can be used to compare the base to base widths of the High Knob Massif with other mountains in Virginia and the Appalachians ( as well as to view the entire HKL and Cumberland Mountain Overthrust Block using larger zoom out distances into space ) ]. During the June-August period of 1996 a rainfall total of 24.60" was reported in the Maple Gap of the High Knob Massif, verses 14.25" in the Head of Powell Valley and 15.23" at Norton Water Plant. [ Since the Maple Gap total was from an automated rain gage, the actual rainfall amount was likely in the range of 26.00-28.00"+ ( since tipping bucket gages read lower than hand-measured rain gages ), such that the true difference was likley up to 14.00" more than in Powell Valley ( vs the observed 10.35" difference ) ]. 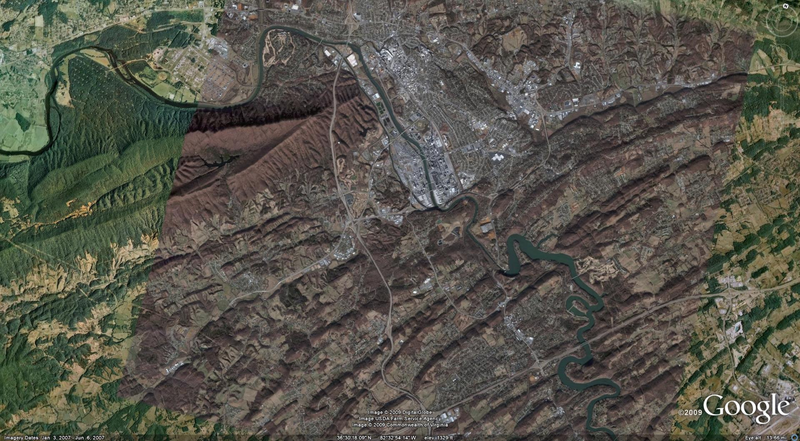 Knoxville ( TYS ) TN: 9.06"
Tri-Cities ( TRI ) TN: 12.74"
The superimposing of wet-dry feedback processes gets complicated within the High Knob Landform by orographic influences. 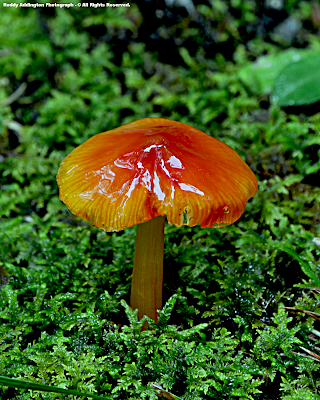 One of the most clear cut examples of a wet feedback was well documented at the TRI during their wettest summer on record, with 25.26" of June-August rainfall in 2003. Knoxville ( TYS ) TN: 16.20"
Appalachia Lake Water Plant: 16.43"
Flat Gap of High Knob Massif: 21.63"
Fast-forward 7 years and the summer of 2010 has thus far been an excellent illustration of a dry feedback at TRI, with only 4.54" of rain measured during June-July ( a complete recap of July and summer statistics will be given later ). 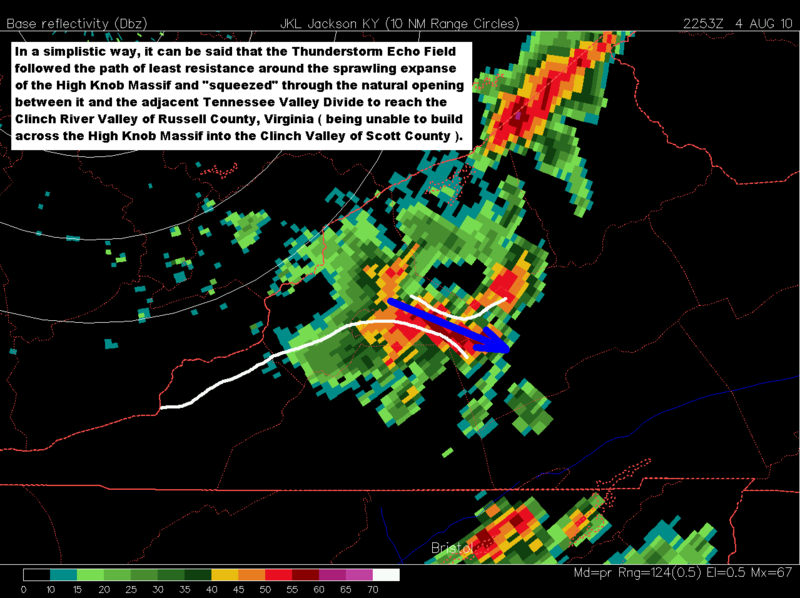 Seemingly every shower or want-to-be echo developed into a downpour as it entered the area around Tri-Cities Airport during summer 2003, in dramatic contrast to 2010 when echoes have been falling apart as they enter the Great Valley and TRI. 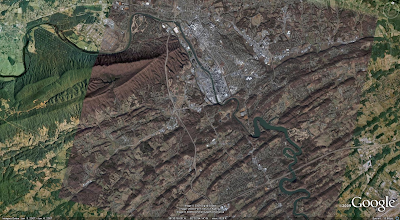 [ At exactly the same distance in space, note that one would have to travel from Tri-Cities Airport, at extreme lower right, all the way across to the top & upper left of this image ( past Kingsport ) to equal the base to base distance across the visible portion of the High Knob Massif above ( not its greatest width ) ]. You may have noticed that once a location takes a "good" hit, there can be additional heavy falls of rain on consecutive days if the pattern is favorable for new developments. Case in point, the July 26-28 period when portions of the massif between Big Cherry Basin and Little Stony Basin were pounded on conscutive days. By no coincidence, this was the general portion of the massif that I had noted on my July 15 update as having received the most rainfall during the first half of the month ( around 3.00" ). While rainfall was highly orographically forced during July 26, with only localized formation over the rugged backcountry of the massif, it was much more widespread during July 27. A rainfall max again zeroed in on northern Scott County, over and adjacent to the same corridor that got under torrential downpours on July 26. [ That JKL Doppler was estimating correctly was verified by a NWS rain gauge measurement by Jack Pitts at Appalachia Lake WP, where 2.33" were measured during July 27 ( right within the Doppler estimated 2.00-2.50" bullseye over Bens Branch Basin and rugged Little Stone Mountain ) ]. 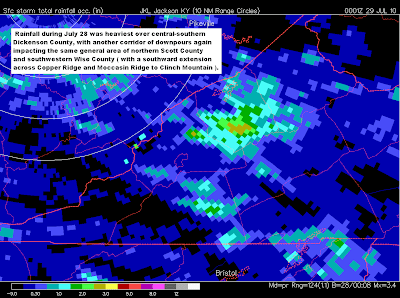 Although the heaviest rains during July 28 became concentrated over central-southern parts of Dickenson County, downpours again managed to strike the corridor from Appalachia Lake across the upper Big Cherry Basin into northern Scott County! By contrast, just a few air miles north of this main hit zone only 0.80" of rain were measured during the July 26-28 period by Otis & Nancy Ward in the Robinson Knob community of the massif. The story was much the same along northern flanks of the massif, with the July 26-30 period dropping 3.10" of rain upon Appalachia Lake WP and just 0.53" at Norton WP ( 6.7 air miles to the ENE of Appalachia Lake ). [ During June both Norton WP and Appalachia Lake measured exactly the same amount of rainfall, with 5.68" totals ( actually rather amazing ). 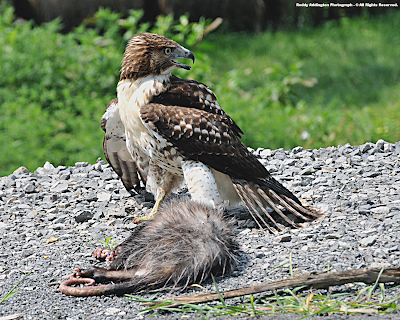 Did the large July difference between the two locations develop merely by chance, or was a short-term feedback at work? ]. So just what is this feedback? "Feedback processes can be very important to the development and extension of dryness into drought, especially if the synoptic-scale weather pattern favors the development of drought over a region ( e.g., 1988, 1999, 2007 ). On the other hand, feedbacks can also be very important to the development and extension of wetness into patterns favoring high water problems and killer floods. Much like changes in temperature of the ocean surface are communicated to the overlying atmosphere, so too are changes in soil moisture over land. When a land area becomes unusually dry the evaporation of water from its surface and the transpiration of water through vegetation ( the combination is known as evapotranspiration ) diminishes. As time passes this diminishment of evapotranspiration is communicated to the overlying atmosphere, and rain producing mechanisms begin to weaken. A negative, with respect to rain production, feedback develops. When a feedback process counter to rain production forms over an area a weather system, such as a warm season cold front which would typically produce widespread showers & storms, ends up producing only isolated-scattered activity as its energy is depleted by the drier air ( in this case, drier air equating to less available potential energy for conversion into kinetic energy used to drive storm circulation & development ). This in turn acts to reinforce the dryness, which grows from a short-term nuisance into a long-term headache for farmers, backyard gardeners, and those whose jobs are to supply towns and cities with a bountiful supply of liquid sunshine! When showers and thunderstorms move over an area where moisture evaporation rates are high they tend to become more efficient producers of rain, simply because they have more moisture ( and latent energy ) available to work with. When showers & thunderstorms move over an area where rates of evaporation are low, by contrast, they tend to become less efficient rain producers and often weaken in intensity. As simply stated by meteorologist Tony Cavalier, of WSAZ-TV in Huntington, W.Va., "dry breeds drier and wet breeds wetter during the growing season." The driving force behind this truly amazing positive-negative feedback principle is an intimate, invisible, but powerful communication between conditions at the earth's surface and those in the swirling fluid of atmosphere above. 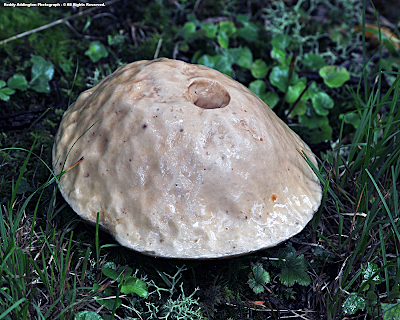 Anything that can change the surfaces of earth can in theory alter this delicate positive-negative feedback process and tip the scales toward either dryness or wetness. An actual reason not typically cited in the media frenzy of today as to how increasing activities of humans can play important roles in climate change ( i.e., through changing the surface energy balance in non-CO2 related ways ). Feedback processes are obviously a special feature of the warm season when moisture evaporation rates are high, and subsequently become less of a factor as evaporation rates decline amid colder weather of late autumn and winter." [ NOTE: The following section contains a portion of my research and has been part of presentations I've given on the climate & weather of southwestern Virginia ]. As north to south ( or horizontal ) temperature gradients weaken, during late spring into summer, pressure gradients that drive large-scale winds diminish and give way to surface based instability and atmospheric patterns driven by thermal heating = a diminishing of orographic forcing! Orographic forcing, in particular the very important seeder-feeder process, can still operate during the convective season, but organized large-scale winds are typically lacking in the mean so that forcing is much weaker outside of any low-level jets or disturbances like tropical lows or mesoscale convective vorticity centers which are associated with MCS or MCC activity. [ The Orographic Forcing Season in southwestern Virginia tends to run from November through April, with October and May often being months of transition ( May can be the wettest month of the year when orographic forcing & convection are both dominate modes of precipitation enhancement, while October can be the driest month as convection wanes and orographic forcing is only beginning ). 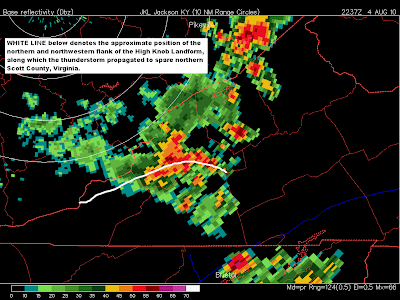 The Convective Season in southwestern Virginia tends to run from June into September and is denoted by that time of year in which the mountain landscape is dominated by convection ( the exact months comprising these two distinct seasons varying from year to year as synoptic patterns vary around the globe ) ]. The landscape becomes dominated by an often chaotic array of hit-miss showers and storms, with wet-dry feedbacks becoming superimposed upon the precipitation regime ( these feedbacks being occasionally enhanced or extirpated by patterns forcing formation of repeated MCS or MCC activity that may be associated with heat dome peripheries called "rings of fire." ). [ Tropical cyclone trajectories also serve the same basic atmospheric function, by forcing massive low-level inflow and exhausting massive upper-level outflow with compensating regions of subsidence ( i.e., creating or working to enhance wet feedback in their strike zones and dry feedback beneath their rings or quadrants of sinking air ) ]. An area that was the wettest during the orographic forcing season, can suddenly become one of the driest during any given day, week, or month(s) dominated by convection. Big Cherry Dam of High Knob Massif: 13.29"
North Fork of Pound Dam: 5.64"
Big Cherry Dam of High Knob Massif: 1.40"
North Fork of Pound Dam: 6.00"
Variations in convective patterns are forced by topography in very interesting & complex ways with feedback processes typically superimposed upon the following ( but with exceptions, of course, where they work to modify some of these processes ). 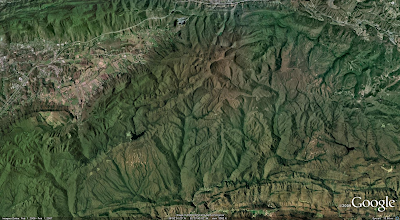 Takes advantage of thermal instability and upslope along flanks of larger mountain masses to move, or propagate, storm cores around interior crestlines ( very well documented within the High Knob Landform ). Forced by frictional drag to enhance low-level convergence and/or divergence of air into/out of storms. Downdraft outflows can become channeled through steep gorges, with dense and often water loaded air combining with different slope settings and gravity to increase or decrease convergence and divergence of storms around topographic features. When air flowing over rugged terrain is potentially unstable, the lifting induced by a mountain can lead to the release of instability. Orographic clouds take forms of swelling cumulus or cumulonimbus. a ). By linear theory, vertically propagating orographic gravity waves can tilt upstream to enhance lifting upstream of mountain masses. b ). Triggered by blocking or partial blocking of flow by terrain, which forces air to rise upstream from the mountain barrier. Sometimes called the "elevated heat island" effect, with inflow and convergence into upper elevations of mountain crestlines or spreading masses ( if present ). Can trigger rainfall over higher terrain or leeward of it with any wind drift away from original cloud forming zones. a ). Can arise by differential thermal advection, in which low-level flow blocking allows cooler and/or drier air aloft to be transported downstream of windward slopes, where it acts to destabilize the local vertical column to support convective development amid still warm, moist low-level air. 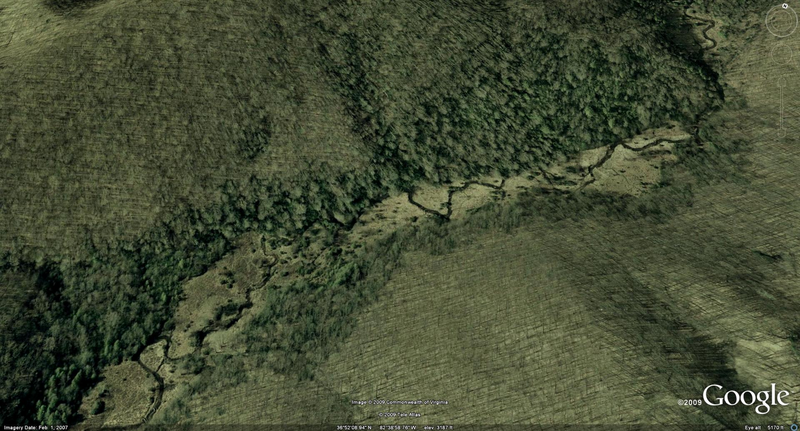 ( or between topographic openings ). Vertically propagating orographic gravity wave induced by flow over a mountain generates upward motion in mid-levels, while thermally induced upslope flow ( e.g., on southern slopes ) generates upward motion in low-levels. Ascent regions of gravity waves leeward of their orographic source region work to enhance growth of cumulus convection, while descent regions of gravity waves work to suppress or stall the growth of cumulus convection. Orographically forced clouds across ridges, and especially major mountain masses, can establish a marked contrast with surrounding regions of partly to mostly sunny skies. Under right conditions, this can develop marked gradients in temperature and instability. [ The truly mind blowing aspect is that all parameters which define a current state vertical column are subjected to a complex combination of factors outlined in only the most minute detail above, in addition to an unknown array of external and internal forcings within the larger domain of the climatic system. That the very best computer models OFTEN preform pitifully in forecasting convection is testimony to the job of handling nonlinear parameters which naturally trend toward chaos. A subject for another time! ]. 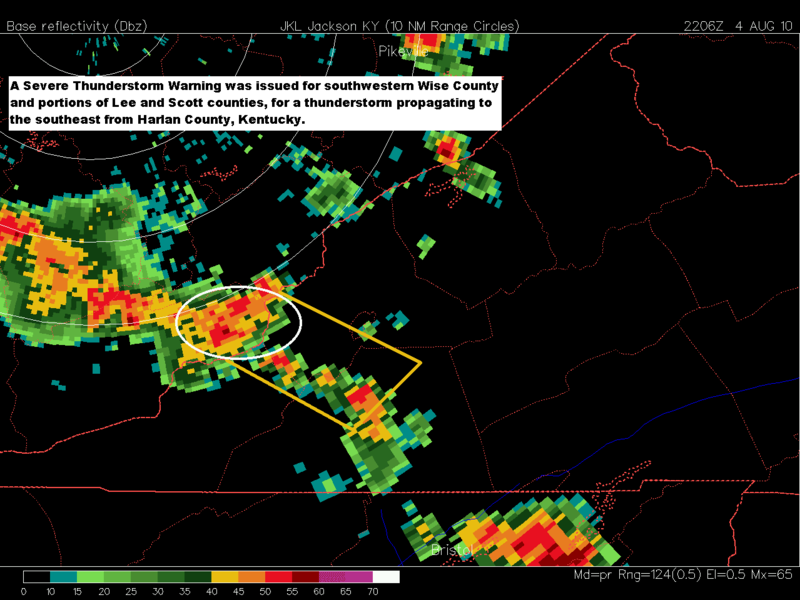 A severe thunderstorm approaching Wise, Scott, and Lee counties prompted a warning during the late afternoon of August 4. 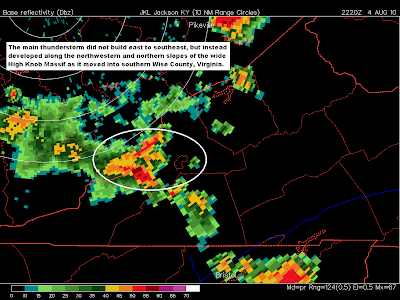 [ The severe thunderstorm, within the WHITE circle above, was at the end of a southeastward building line of convection that already had some activity farther southeast over Scott County, Virginia ]. Structural changes in storms interacting with the High Knob Massif are common, such that very few if any ( even long-lived Supercells ) have ever been observed to not undergo a forced change upon interaction with the massif. While it is true that thunderstorms never just move from point A to point B but continuously develop and redevelop between points along their trajectories, the changes observed around the WIDE High Knob Massif are different from those typically seen in point to point propagation. 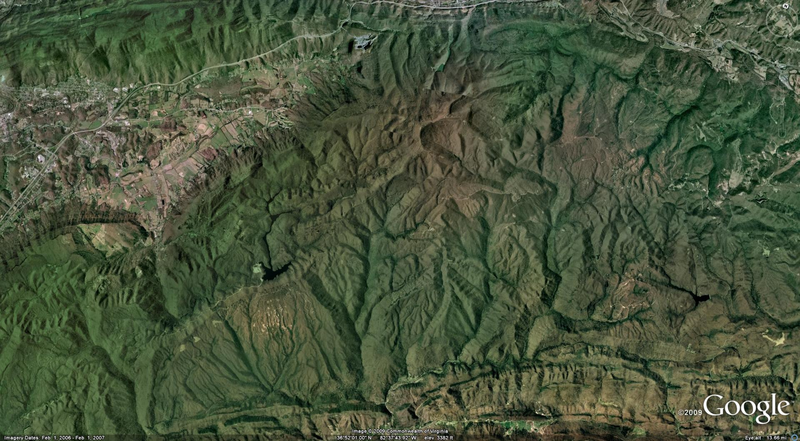 This case is a good illustration of how topography forces changes in patterns of convection, with the northern & northwestern flanks of the High Knob Massif becoming the focus for development and redevelopment of the strongest echoes. However, this case involved more than just storm flanking, with at least several of the above TEN points being utilized in getting this severe thunderstorm around the High Knob Massif. [ In a most simple way of stating it, as I have often written before, the High Knob Massif is highly exposed to inflowing air along most directions of the compass. 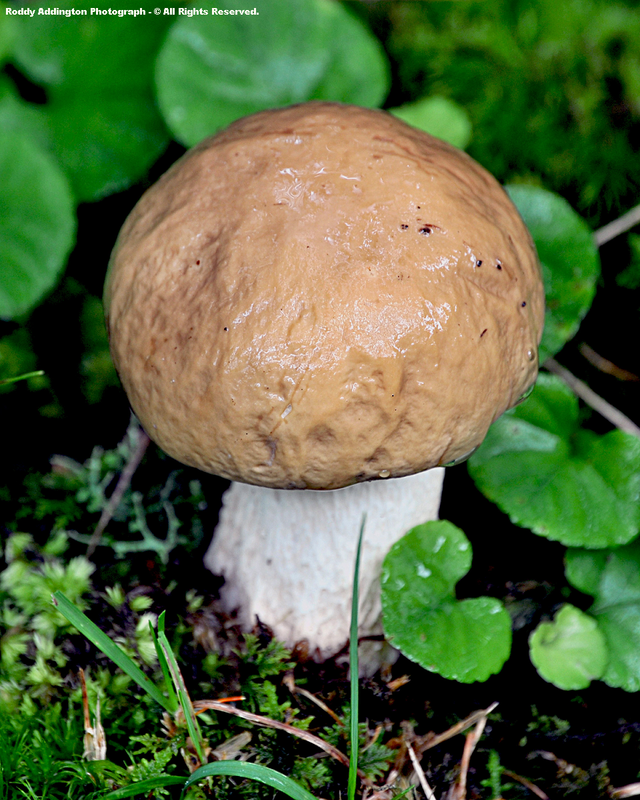 It stands like a WIDE rock in a flowing river that deforms the flow of its water. In this case, the High Knob Massif deformed the flow of the fluid atmosphere and essentially moved this severe thunderstorm around it in such a way that spared folks in Scott County from its impact ( to them, that was the bottom line of this day ). 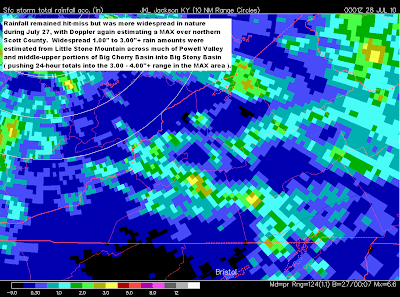 Although it appeared that Big Cherry Dam was going to take a direct hit, it ended up getting only 0.05" of rain! ]. [ Upper Norton Reservoir has an elevation of 3308 feet above sea level, with the lower lake sitting at 3230 feet, amid majestic Benges Basin of the High Knob Massif ( adjacent to the natural wonder of Flag Rock Recreation Area ) ]. *The 27-year July average rainfall was 5.27" at Norton Water Plant during the 1983-2009 period. In the High Knob highcountry July temp means varied from 70s to around 80 degrees by day to mid-upper 50s at night for elevations above 2700 feet ( above 2100 feet for night-time 50s in cold air drainage valleys ). 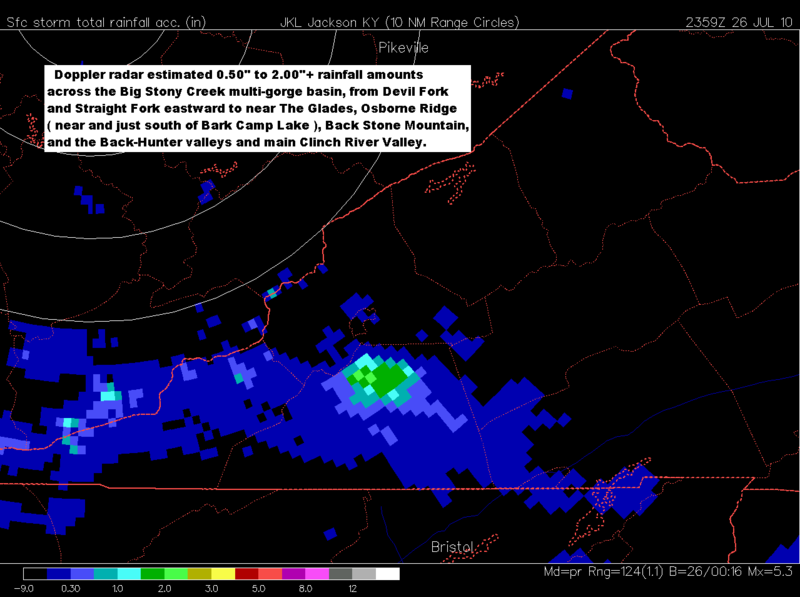 July rainfall totals varied from just over 3.50" to more than 8.00" in the High Knob highcountry, with both the lesser and max amounts being in relatively close proximity to each other eastward of Big Cherry Basin within rugged, complex terrain of the Big Stony Creek and Little Stony Creek basins. ( * ) - Denotes data loss during the harsh 2009-10 winter, when the NWS rain gauge froze and busted. ( M ) - Denotes that the actual total fall was greater than rain gauge amounts due to a combination of evaporation between the hand-measurements and losses amid wind & sub-freezing conditions. 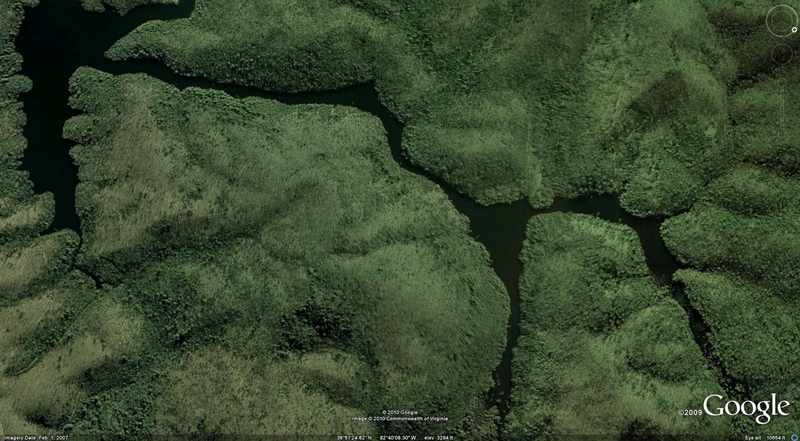 [ Imagine how tiny a human is standing next to one of the trees in the above image, and what a long hike it would be up this winding, wetland valley. 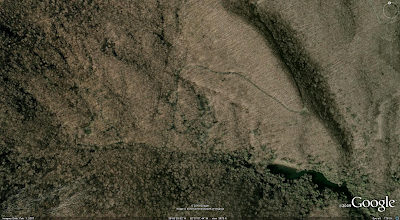 A major cold air drainage situated between Big Cherry Lake and the peak of High Knob, with valley floors at 3150 to 3200 feet above sea level ( more than 1000 vertical feet lower than the basin head ) ]. 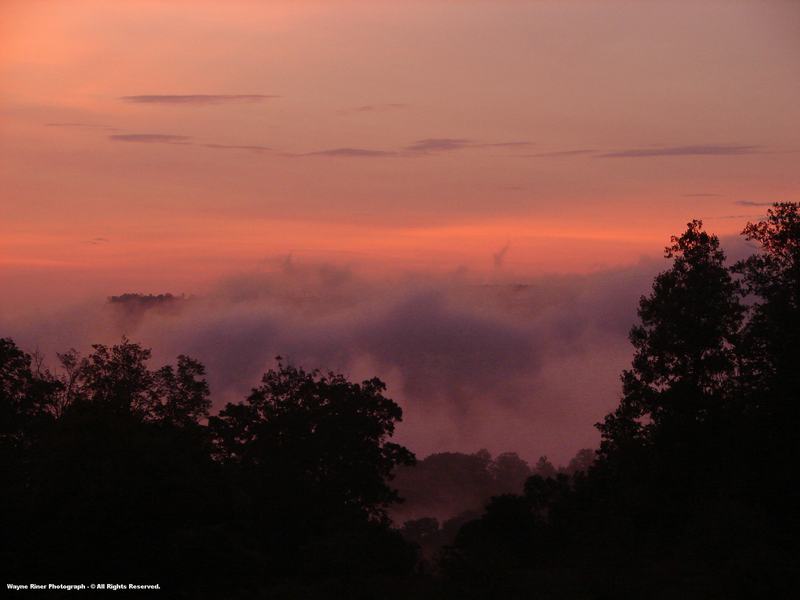 Its been a wet growing season in 2010 amid the Big Cherry Basin, with abundant rains feeding the wetland valleys above the Lake. While 21.53" have been hand-measured at Big Cherry Dam since May 1, even more has accumulated according to Doppler radar across the middle-upper basin. *Approximate totals as indicated by Doppler radar and rain gauge measurements at Big Cherry Dam, Eagle Knob of High Knob, and Norton Water Plant. 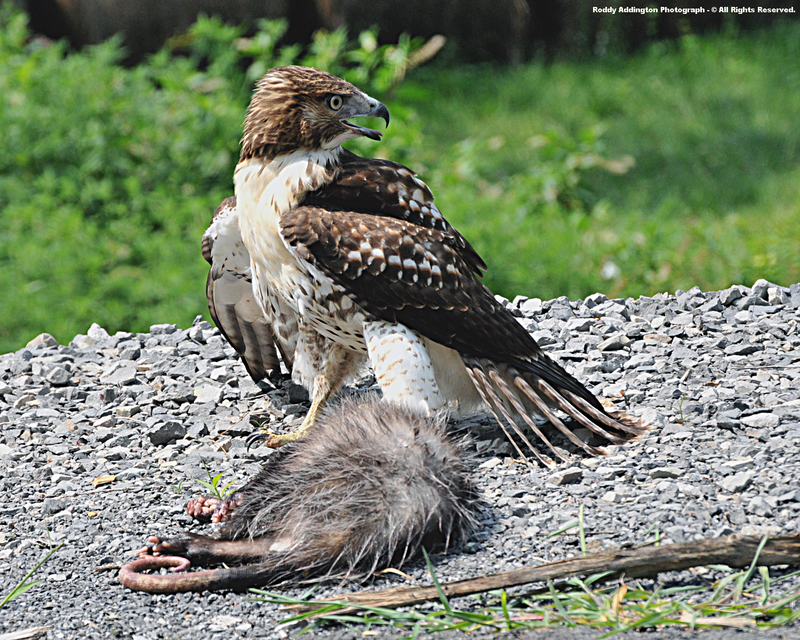 Aerial coverage was below average during the more spotty, hit-miss distribution in July. The difference between this MAX estimate and the Big Cherry Dam total is not as great as on paper, since weekly evaporation losses occurred at Big Cherry Dam during the May 1 to August 1 period. [ The rugged Devil Fork Basin has long been a proposed Wilderness Area ( which needs to be created ), that is a designated Virginia Mountain Treasure. 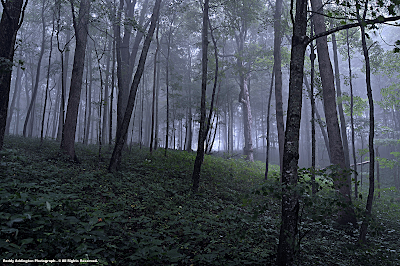 It is a favorite hiking and hunting area, complete with a whitewater creek and plunging tributaries into Devil Fork Gorge. 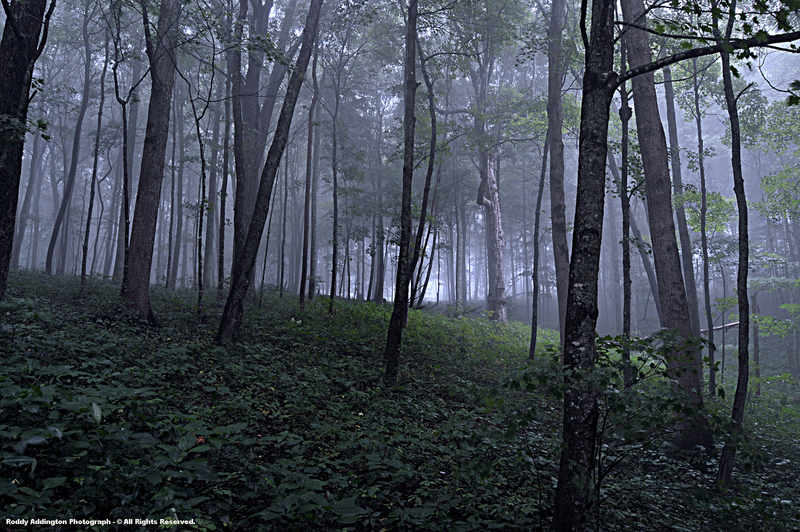 Waterfalls, rock formations, and simply spectacular vistas from both mountain flanks ringing the Devil makes it a natural wonder amid northern Scott County, Virginia ( it forms a small porton of the long backslope of the High Knob Massif adjacent to Big Cherry Basin ) ]. 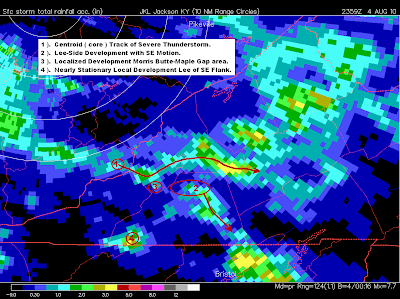 There is high confidence in the above totals, since the official NWS tally at Big Cherry Dam was 14.54" during the June 1 to August 1 period, with Doppler radars clearly showing much more rainfall during May and July across middle-upper portions of Big Cherry Basin than at the Big Cherry Dam measuring point. [ The greatest difference being observed during May when Big Cherry Dam missed several heavy rains in thunderstorms crossing mid-upper portions of the basin during mid-late May ( following the flash flood event that opened the month ). These heavier rainfall amounts during the growing season have also been verified by continuous overflow of the spillway at Big Cherry Dam up until the drier, hotter conditions of July, when the Lake dropped slowly to 1 foot below full pool by July 26 ]. 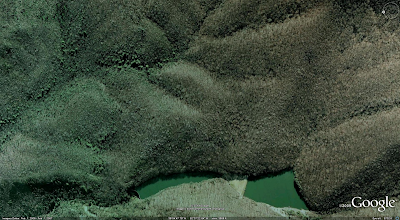 [ Bark Camp Lake of Little Stony Basin was amid wetter portions of the High Knob Massif during July. Extensive wetlands also exist above this Lake amid upper valleys of this 16.4 square mile basin ( the beginning of the wetlands is visible in upper left ) ]. 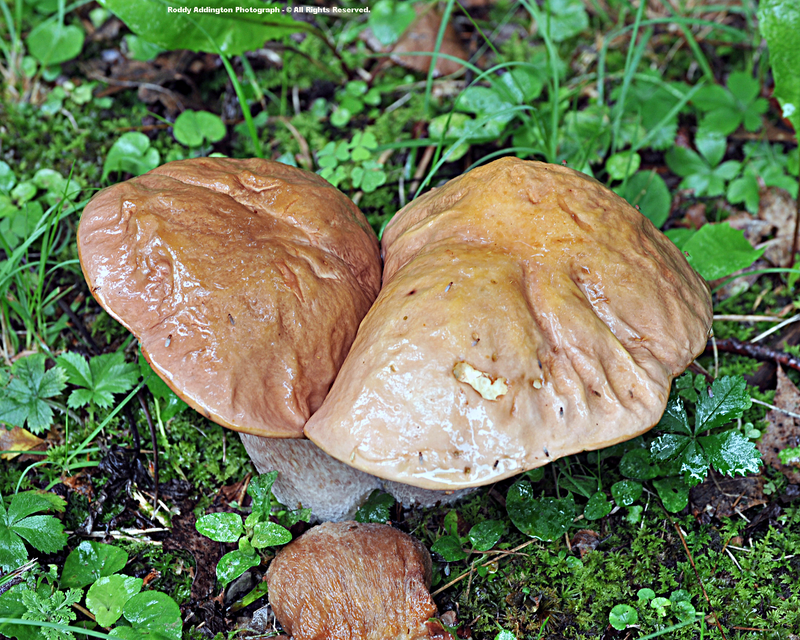 Paired Mushroom & Fruit Flies? [ For most NWS Cooperative stations this ends during the morning of July 31, and does not include any rainfall through midnight July 31. For the major stations it includes any rain falling through midnight July 31 ]. Clintwood 1 W: 3.24" / 9.33"
Nora 4 SSE: 4.45" / 8.41"
Breaks Interstate Park: 5.29" / 11.68"
North Fork of Pound Dam: 3.12" / 10.00"
City of Norton WP: 2.43" / 8.11"
Appalachia Lake WP: 5.41" / 11.09"
Big Stone Gap WP: 3.81" / 9.93"
Robinson Knob of High Knob: 3.60" / 8.69"
Big Cherry Dam of High Knob: 4.27" / 13.80"
Saltville 1 N: 5.24" / 10.61"
Burkes Garden: 3.31" / 7.82"
Abingdon 3 S: 3.42" / 7.06"
Wytheville 1 S: 2.21" / 6.11"
Covington FP: 4.06" / 5.69"
Gathright Dam: 2.86" / 4.03"
Holcomb Rock: 4.53" / 6.10"
Dale Enterprise: 2.21" / 3.31"
Luray 5 E: 3.66" / 6.56"
Washington Dulles: 4.17" / 5.46"
Washington National: 5.17" / 7.04"
Wallops Island: 1.90" / 3.53"
[ NOTE: There is little difference between July rainfall and the combined June + July total in locations that had a DRY June ]. Buckhorn Lake State Park: 4.15" / 8.01"
Mount LeConte: 10.01" / 17.42"
Beech Mountain: 4.42" / 7.61"
Banner Elk: 5.63" / 8.08"
Vilas 1.8 WNW: 3.64" / 6.05"
Grandfather Mountain: 4.96" / 6.93"
Spruce Pine: 2.79" / 7.82"
Mount Mitchell: 2.94" / 7.62"
White Sulphur Springs: 4.73" / 7.34"
Lewisburg 3 N: 3.68" / 6.52"
McRoss 3 E: 4.83" / 8.48"
Snowshoe Mountain: 6.44" / 11.76"
Glady 1 N: 5.17" / 8.91"
Hacker Valley: 7.71" / 13.76"
Davis 3 SE: 4.27" / 8.24"
[ Note: There may or may not have been any rainfall on missing days at the indicated stations ]. Although summer still rules the mountain landscape, long-term mean temperatures begin dropping during August. It can occasionally get cold enough to frost, especially within the mid-upper elevation basins. A better understanding for how cold it can get in higher mountain valleys is obtained by looking at the longer-term record period of Burkes Garden. The fact remains that August still holds the all-time highest temp on record at the elevation of Wise, with 94 degrees being reached on August 18, 1988. August 2010 is expected to follow the general trend of this summer, and to have above average temperatures. While August typically averages more than 1.00" of rainfall per week, it is the 3rd driest month of the year over the long-term in the City of Norton ( with a MEAN of 4.17" observed during the 27 years from 1983-2009 ). 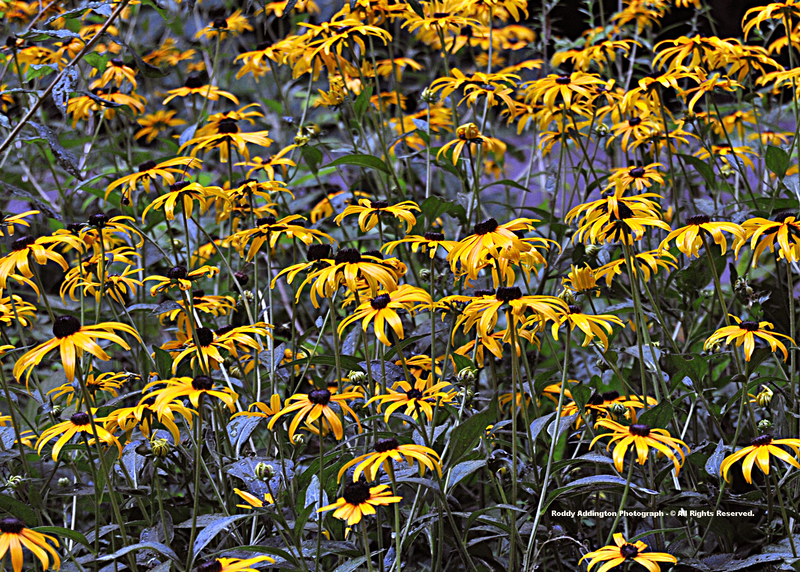 August 2010 is off to a fast start, with a general 1.50" to 3.00"+ of rainfall during its first 5 days. *Recent rains have pushed 2010 precip totals into the 40.00" to 45.00"+ range within wetter parts of the High Knob Massif ( 32"-35" in the drier sections ). [ *Generally near to below average for this time of year, with a 0.44" surplus in Clintwood and a 4.00" deficit in the City of Norton ].